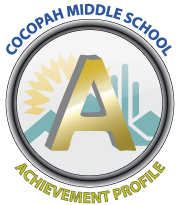 Today The Arizona Department of Education announced the A-F Achievement Profiles for the 2013-2014 school year and I am proud to announce that Cocopah has achieved an “A” for the first time. As a community, we improved our score by 14 points, which is a tremendous accomplishment. I would like to personally extend a thank you to our parents, teachers, staff and students for their part in helping us achieve this recognition.